After introducing Teachertube just a few days earlier I received an email pointing me to Vidipedia which is a video encyclopedia, basically Wikipedia with Videos. The basic idea is of course the same: you search for a phrase or browse a category on Vidipedia and results are shown on the next page. If only one result exists it will automatically be opened on its video page so that you can start to watch the video right away. If a single video is found, it will be shown in video player mode which loads and plays the video automatically. Multiple results are displayed as thumbnail images on the results page along with their title, the category they have been sorted into and the number of views. All videos can be downloaded in flash video format (flv) to your computer. Videos can be embedded into websites as well which means it offers the same basic functionality as YouTube and other video hosting websites. 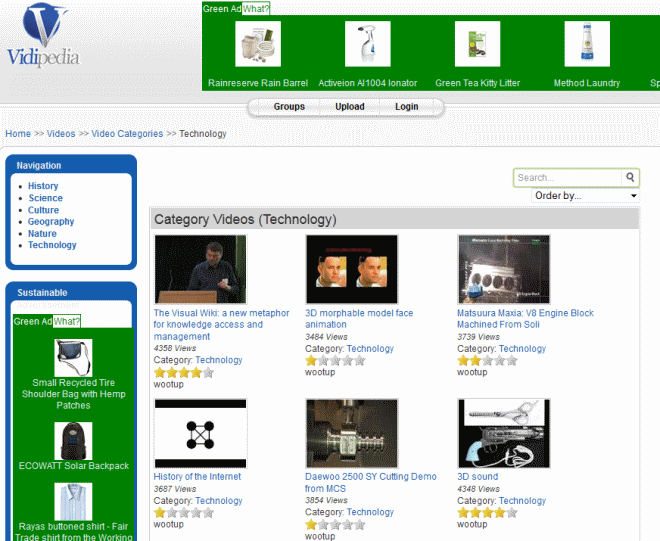 Vidipedia is not the most popular of sites and does not come near the popularity of Wikipedia or YouTube for that matter. But that does not mean it has nothing to offer to you. The site concentrates on six categories that include history, science, nature and technology which may be interesting to users who would like to watch informative videos. While that is also possible on YouTube, it is much harder to get your hands on those videos on YouTube due to the sheer number of them that get uploaded to the site every day. Vidipedia is a niche site that tries to provide you with access to "knowledge" related videos. The site lacks updates as it seems and while you do get access to hundreds or even a couple of thousand videos there on it, it simply cannot provide videos for all searches that users of the site may have. It is far away from being a Wikipedia for videos. You may have better luck finding videos on YouTube than on this site. While you may spend more time browsing through them on YouTube, you can almost be certain that you will find what you are looking for on the popular video hosting site. Update: Who would have thought that. Vidipedia is also still alive and kicking and videos seem to be uploaded to the site regularly. While it does not offer the same amount of videos as are uploaded to YouTube in a single minute, it may still be an interesting destination if you want to learn things and not just be entertained. The site navigation lets you pick a subject, e..g history or nature, and displays videos that have been added to that category when you click on it. From here it is a matter of clicking on a title to play it right on site. Most videos these days appear to come from YouTube though.